In 2006 Colgate released these three Superman toothbrushes that were sold separately. Each toothbrush is molded in a different set of colors and features a different image. The first one is red and blue with a standing image of Superman. 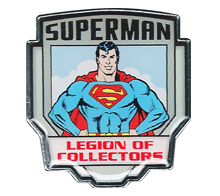 The second is silver and blue with a side view of Superman in flight. The third toothbrush is a reversed red and blue showing Superman flying toward you. June 11, 2018 in HEALTH / GROOMING. July 3, 2017 in HEALTH / GROOMING. Released in 2006 was this Superman toothpaste by Colgate. This tube contains 4.6 ounces of Bubble Fruit Flavor fluoride toothpaste. The tube itself features a promotional flying image of Superman. May 11, 2017 in HEALTH / GROOMING. November 16, 2015 in HEALTH / GROOMING, TOYS.